The Ulster Hall is a venue used for concerts, fairs, political meeting and other interesting and less interesting happenings. The venue has space for 1800 people standing, or 1000 people seated. This makes it a small concert venue compared to Odyssey Hall and some others, but still it is frequently used for semi-popular concerts and events. It was built between 1859 and 1862 and was designed by the same guy designed the Albert Memorial Clock (William Barre). One of the most memorable things happening here took place in 1971 when Led Zeppelin first performed “Stairway to Heaven” live. 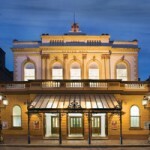 The Ulster Hall is located near the Europa Hotel and the Grand Opera House, not far from the inner city centre of Belfast.